The Social Media Game was played for the first time at the UK National Circuit Rider ConFerence January 2007 following a presentation by Beth Kanter and David Wilcox. When further developed, we hope that the game will be useful to those with roles (*) such as circuit riders, technology stewards, social reporters, buzz directors in helping individuals, groups, organisations and networks plan how to use social media. The purpose of this first simple version is to trigger conversations about what social media tools may be appropriate in different situations, and further explore the issues raised in the presentation by David and Beth. 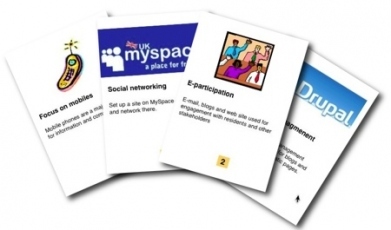 A pack of cards showing different social media tools. Each card has an image (so they can be easily distinguished), a tool description, and a possible issue or question for discussion. A figure -1, 2, 3- indicates a notional cost in terms of cash, time, commitment. There are blank cards so people can add ideas. See Text of the cards. Scenarios - one-liners about a group, organisation, network or other situation in which tools may be used. EXPLORATION. Staff are encouraged to spend time exploring blogs and other social media and leave comments. How do you answer "why bother" ? INDIVIDUAL BLOG. Set up a single user blog. Are you comfortable to develop a voice online? ORGANISATION / PROJECT BLOGS. Organisation uses blogs to support projects, programmes, and events. Comfortable with having a conversation with your audience? Ready to commit to ongoing posting? SOCIAL BOOKMARKING / TAGGING. Staff search and bookmark sites with associated keyword tags. Willing to make an effort to share? Can you deal with the messiness? VIDEO. Staff and volunteers use video clips to tell stories. Blog to embed the results? WIKI. A wiki provides groups with collaborative publishing and workspace. Confident about collaborating? INSTANT MESSAGING. All staff are encouraging to be available online for chat. Save time or waste time? MOVE TO FEEDS. Increasing use of blogs and other tools mean most content can be read using RSS feeds. Will people use this as well as email? MYSPACE. Organisation sets up a site on MySpace and networks there. Is MySpace the right space for you? NETWORKING APPROACH. Think about connecting people in ways that work for them - then choose tools. Is the organisation too hierarchical for this? OPEN SOURCE STRATEGY. Commitment to use in-house OSS wherever possible. In-house skills or developer budget to maintain? PHOTOSHARING. Staff are encouraged and supported in the public sharing of photos. Enthusiastic photographers prepared to share? PROJECT COLLABORATION SYSTEM. Commercial project management and collaboration system like Basecamp used internally. Another system to learn and integrate? SKYPE - VOICE OVER IP. Staff encouraged to use Skype for free calls over the Net. Will headsets dissuade people? VIRTUAL PRESENCE. A free system like Vyew allows real-time sharing of presentations and files, plus messaging. Will enough people use this? CMS WITH BLOGS. Organisation moves to Drupal or other content management system, with blogs for all. Is there a set up and support budget for a developer? FREE EMAIL. Everyone moves to Gmail or similar and integrates with other free web services. Are you happy for Google to hold your data? FREE WEB SERVICES STRATEGY. Commitment to reduce desktop software in favour of Google, Yahoo etc Relies on being always online? 1. Workshop participant split into groups of 4-6. 2. Each group is given a one-line scenario: e.g. local service organisation, national campaigning body, regional network. They spend a couple of minutes expanding on this, and the likely communication needs. 3. Groups choose from a pack of tools cards to address scenario - budget of 10 points reflecting cost/effort. Also choose one of the S cards - free Web services, Open source strategy to indicate approach (not sure about this). 4. Groups can add their own cards. If so, they ask the organisers what budget their idea attracts. 5. After choosing/adding cards to address the scenario, the group reflects on issues/queries on the cards chosen. What's going to be the big challenge? If there's more time we usually go into storytelling with a timeline at this stage - the group is asked to develop the story of how people and groups use the tools in practice. Organisers to throw in crisis/opportunity cards to liven things up! Circuit Riders provide ICT support to voluntary sector organisations too small to have IT staff of their own. A Circuit Rider will support a caseload of organisations. As well as technical knowledge, Circuit Riders have the skills to help organisations develop strategies so they can make the best use of technology. Circuit Riders are grassroots-based, and understand the values and practices of the voluntary sector". Steve Bridger introduced this term for someone in an organisation using social media to create buzz inside and out, and included a great list of ideas in his blog post. David Wilcox is using this term to describe someone who is actively looking for conversation threads and stories in a network, doing some joining up, and helping people extend their voice by using social media. Nancy White suggests that "Technology stewards are people with enough experience of the workings of a community to understand its technology needs, and enough experience with technology to take leadership in addressing those needs. Stewardship typically includes selecting and configuring technology, as well as supporting its use in the practice of the community". Designing for Civil Society is an organization created by David Wilcox and Drew Mackie, who work together in the production of projects and community involvement since 1980, always engaged in the development of games and ludic seminars and workshops. Currently their interests are finding ways to help people to connect and get involved with community organization by using social software and creative events.